Edgewood offers swimming programs, private lessons and team competitions for all levels. The heater is on! Get ready for summer fun! Cost: $26 per half hour – arrangements with front desk. Jaclyn Theleen comes to Edgewood with years of experience as a coach, athlete and teacher. In college, Jaclyn swam for Southern Connecticut’s nationally rank division II women’s swim and dive team and was Captain her senior year. While at Southern, she competed in all free style events, mainly the 200 and 500 free. As a coach, she has experience at the club level helping out the Naugatuck Thunderfish and was the Pomperaug Girls Swimming and Diving Assistant coach for three years. Jaclyn is currently a 6th grade teacher at Rochambeau Middle School in Southbury. 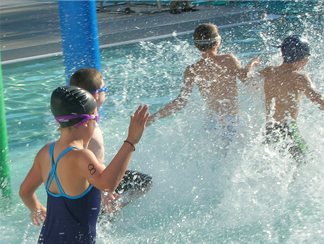 Swim Team is a competitive-fun team for children 4 to 18 years of age to participate in during the summer. The coaching staff promises an environment of positive learning with an emphasis on improvement and self-confidence. Mini- Swim Team – for swimmers who are not quite ready for the full 25 yards. They will work on stroke improvement and strength. Swimmers will participate in meets. It is important for swimmers of all skill levels to keep safety policies in mind when using the pool! Please use the following link to review pool safety and explore the different resources available to swimmers of all ages! Want us to keep you posted on new aquatic programs and events? Our professional swimming staff offer a variety of opportunities for swimmers of all ages to improve their skills. Please note there is a strict 24-hour cancellation policy for private lessons. Want to enjoy a great summer experience for the whole family? We invite you to join Edgewood!